Through 2011 and the first quarter of 2012, there was a small increase in overall email click-through rates (CTRs), despite the ongoing decrease in email open rates. These were two of the findings of Silverpop’s Email Marketing Metrics Benchmark Study that analyzed email performance among 20 industries in 20 countries. Some of the highest email-open rates and CTRs were found in the computer software and media/publishing industries, followed by the financial services and consumer services categories. MarketingProfs.com provided additional details from the email marketing study. The study determined email open rates by taking the number of messages opened and dividing that figure by the amount of messages delivered in the U.S., Canada, Europe, the Middle East, and Africa. The average overall open rate was 20.1 percent, yet the U.S. open rate trailed behind the other global regions at only 19.9 percent. The computer software industry achieved the highest open rates with 55 percent, while the lowest were seen in the travel/leisure and retail categories. Email click-through rates (CTRs) were measured by tallying the number of unique clicks on links within the message divided by the total number of emails delivered within the selected global regions. The average overall CTR was 5.2 percent, with the U.S. achieving the highest CTR of the regions measured, with 5.4 percent. Once again, computer software was among the top-performing industries, yet was edged out by media/publishing. 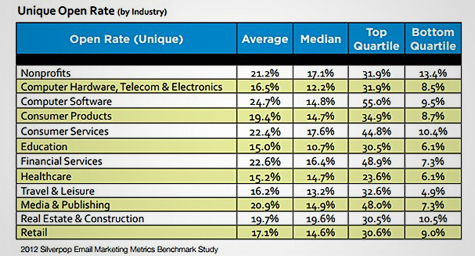 The study also showed that unsubscribe rates varied enormously by industry. The unsubscribe rate was defined as the percentage of email messages delivered that resulted in unsubscribe requests. The computer software industry made another strong showing with the second-lowest unsubscribe rates, yet the nonprofit segment had the lowest rates of all. The highest rates were seen by the travel industry, which was expected, since vacationers often request information before a trip but no longer need it afterward. To discover the latest trends in email marketing to capture your audience’s attention, contact MDG Advertising today at 561-338-7797 or visit mdgadvertising.com.